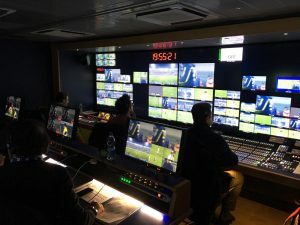 Italy’s NVP has bought a range of live production technology from Grass Valley that will be used as part of an upgrade to its outside broadcast (OB) fleet. The production company and facilities provider is doing the refurb in order to cope with an increasing demand for 4K UHD and HDR content. Installed in NVP’s OB4 and newly launched OB6 vehicles, this implementation strengthens NVP’s position as a provider of live production services in Europe, the company claimed. Both trucks are equipped with Grass Valley’s 4K UHD and HDR-capable, Kahuna 9600 production switcher, Kaleido multiviewers, Densité modular infrastructure, Sirius 840 router and KudosPro converters. These solutions were chosen for their picture quality, flexibility and resilience. The 4K UHD and HDR capability of the Kahuna 9600 and its seamless integration with the Sirius 840 router, together deliver a scalable path to all functionality and format requirements, all critical factors for NVP. The project’s system integration, design and build was provided by Video Progetti, an Italian systems integrator and long term Grass Valley channel partner.